In Part 2, we’re going to go over project setup for GAE and GWT applications, and wire the server (servlet) using Guice and GWT-Dispatch. I’m using Eclipse as my development environment. Install Google Eclipse plugin, and install the provided GWT (2.0.2) and GAE (1.3.1) with the plugin. Create a new project in Eclipse using the “New web application project” wizard, and create a sample project. Find web.xml in /war/WEB-INF. In traditional GWT-RPC development, every service needs to be written as a servlet and declared in web.xml. For Guice + GWT-dispatch, we only need a filter and a listener (as the entry point). This code is borrowed from Hupa. The responsibility of this servlet context listener is to construct an injector (achieved by the last method). Here, our injector contains two modules, ratechecker.server.guice.GuiceServerModule and ratechecker.server.guice.DispatchServletModule. This module has a mapping of URIs and its serving classes. It serves “/ratechecker/dispatch” with RateCheckerDispatchServlet, which is the entry point for GWT-dispatch. This is where you declare your bindings for the application. We’ll come back to this file frequently as the application develops. 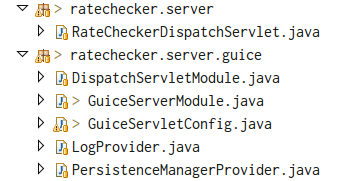 This servlet extends from GWT-dispatch’s DispatchServiceServlet. It’s main responsibility is to provide unified logging. Now everytime Guice sees Log.class declared as a dependency in the constructor, it uses LogProvider.get() method to retrieve an instance of the log if there’s none, and uses the existing log instance if it’s been initialized (because of the singleton scope). We haven’t covered PersistenceManagerProvider but it’s the same idea as LogProvider. It provides an instance of PersistenceManager, which is used by the data store related action handlers to deal with data persistence. That’s it for server wiring. 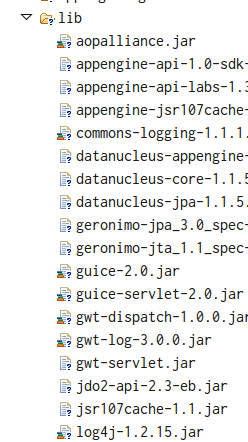 In the next blog post, I’ll go through designing and writing GWT-RPC services using Guice and GWT-dispatch.